and at the northern end, NZ's most historic site at the Stone Store Basin. Heading towards the township is Kaan Zamaan Gallery which holds regular Art Exhibitions. Enter the hub of the township, which is now one-way, for ease of use and parking. A must visit is the Chris Booth sculpture in the domain, near the Procter Library and Council office. Through the other side of town is our own Kerikeri School of Music. Just down the Stone Store hill is the free-to-visit Wharepuke Subtropical Gardens, a Garden of Significance with the NZ Garden Trust. Also, with a print studio and gallery, and restaurant. Down the hill to the site of NZ's earliest 'trading post', since 1819. Kerikeri Mission Station includes the oldest wooden house to survive, and the unique Stone Store, open 7 days. open 7 Days 407 8479. While you're at the Basin, check out Rewa's Village and Discoverers' Garden. 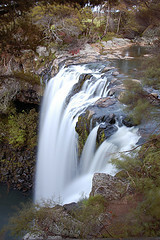 Also, a bush walk to the local waterfall. 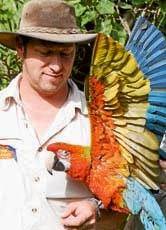 Nearby is the very special Parrot Place, a must-do for all animal lovers.